Last week we had to send 200 mails using a CSV file. I have created a script that reads the information from the CSV file and add it in the mail. In this blog I stripped the script down to a minimum. It may look like a large script but it is possible to combine the commands. 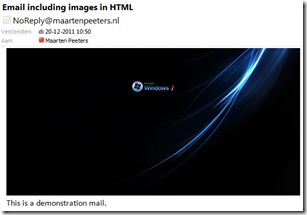 Use this script to easily send multiple mails to customers using powershell and use an HTML layout. This is a demonstration mail. Any comments or improvements on this script are welcome. 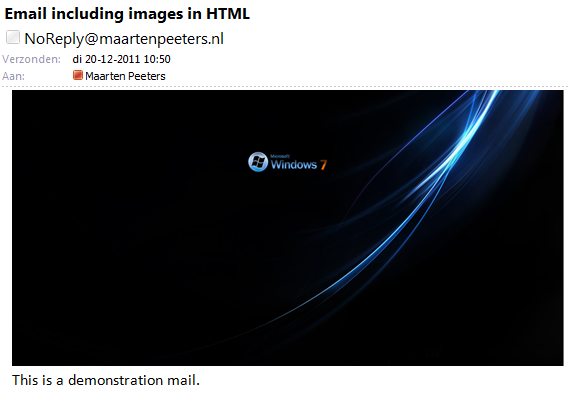 I’m trynig to send an logo on an automatic email using powershell, however I tryed a lot of posts examples and the only result I got is the email with the correct attachement but a brocken link icon instead of the image on the email’s body. So I quit to use my posts compilation and adaptaition i copied your code just changing the image path. And the same thing happened. So I added 2 lines which referes to ContentDisposition. As you can see on the code bellow. Can you find out wy can’t the image appear in body?Is there any step that is obvious to everyone and not for me because its the 1st time I use powershell? You have to specify the attachment ID in the $body. This will place the image in the body. Please let me know if you see the image in the mail after changing the above. this suggestion sill not work, its amazing I search all the internet for a sample how to send email with embedded picture in powershell and all the examples not work. please test your example and share all syntax. please sent me your script and I will check it in the morning. I’m having same issue I only get the broken link icon in my mails. I tried JPG and PNG no luck. Did anyone figure this one out? If someone else is trying to use the code here, then the formatting is a little messed up and you will have to change the single and double quotes back to normal ones if you copy/paste. Thanks for the comment and the improvement. I am able to send the mail using above script but it compressed pic length. What do you mean “but it compressed pic length.”. Please let me know what happens exactly. I understand the problem. This happens because the imagesize is 3300 x 2451 which is large for a mail. It is perhaps possible to style the image tag to the image pixel size so it has a fixed width and height. Or to set the width and height to something which is readable in a mail. Let me know if it works by setting a max-width and height in the tag.